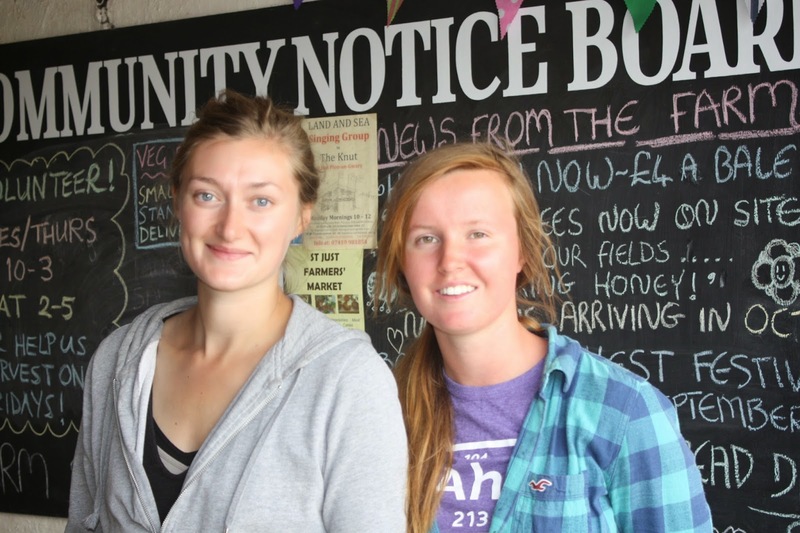 Many thanks to Sophie (from New Zealand, who spent 5 weeks wwoofing with us) and Sarah (from London, who spent 2 weeks wwoofing with us) for all their help on the farm. Sarah (left) and Sophie (right) at the harvest celebration. 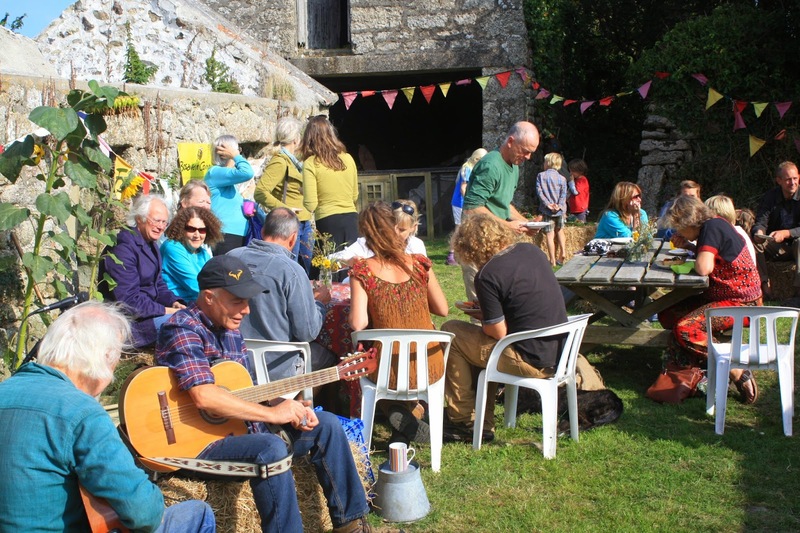 Our harvest celebration on Sunday 21st September was a resounding success, with more than 100 people enjoying the sunshine, food and activities on offer on the farm. Harvest celebration list of activities. 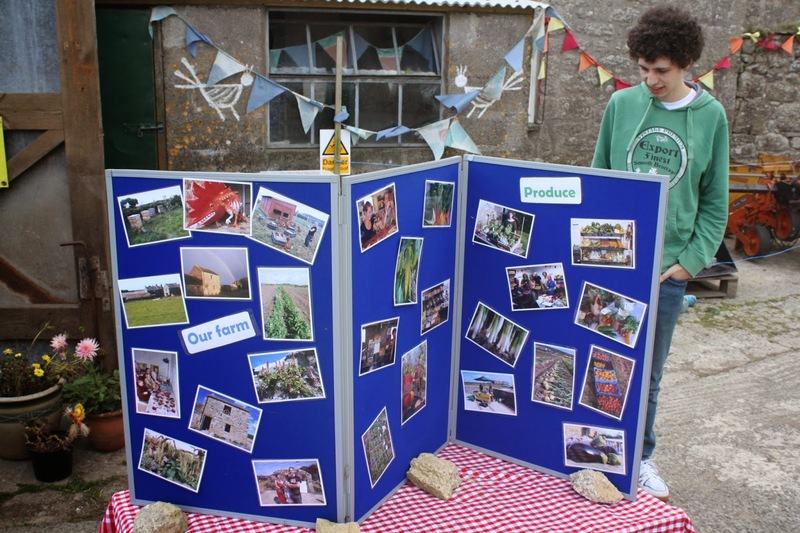 Enjoying the new farm display boards - thanks to Alice for putting these together. 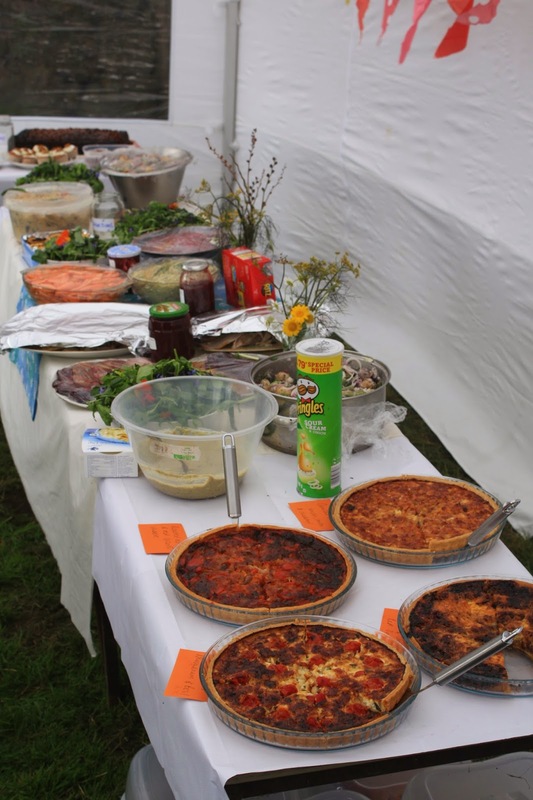 One of the two tables of food to share. Enjoying live music in the farmyard - thanks to Nick and friend for serenading us. Thanks to Kelsey and the singers too. 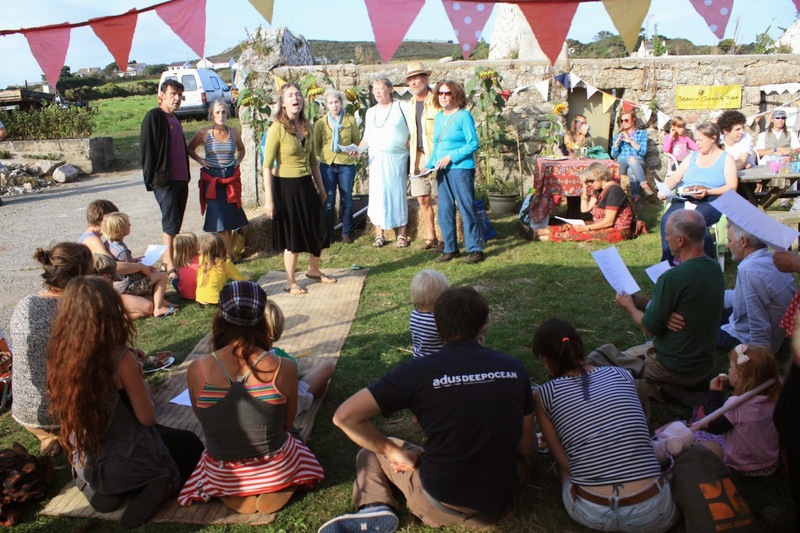 Many thanks to all the volunteers who put so much effort into make the day so special, and to those people who created food to bring along and share, and to everybody who came to help us celebrate the harvest! 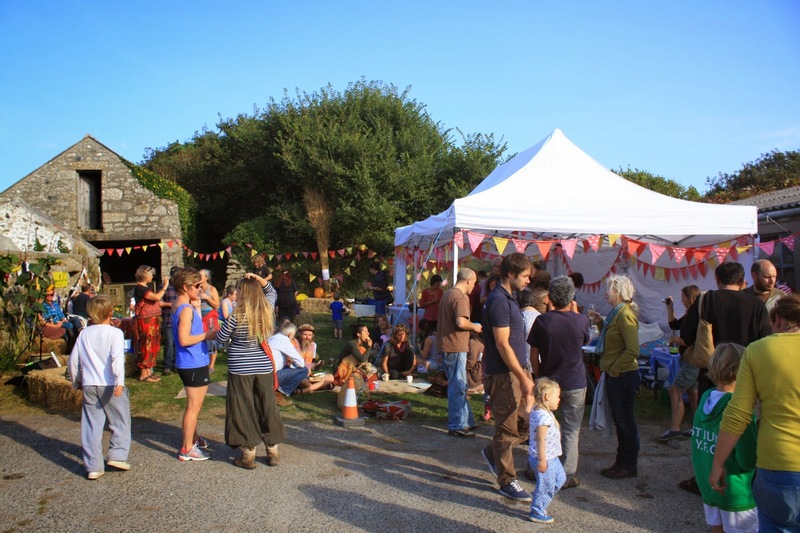 Bosavern Community Farm would like to invite you to a Harvest Celebration on Sunday 21st September, from 2pm till 5pm, at the farm. 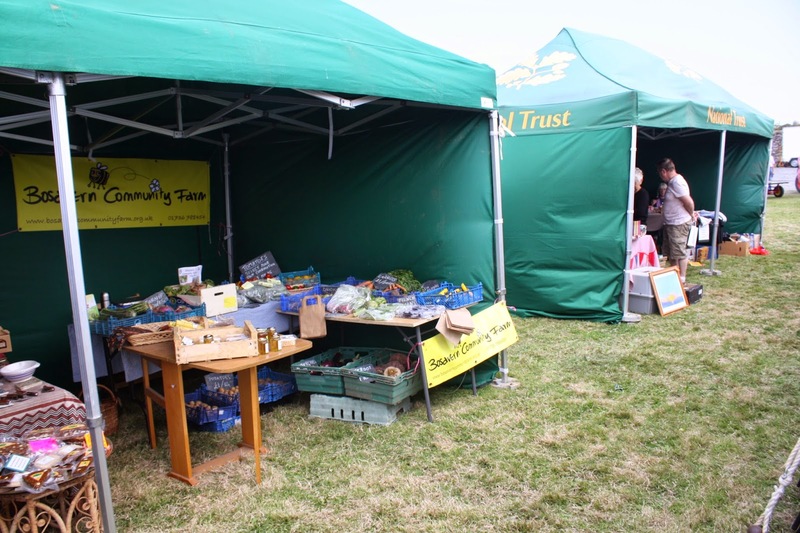 We are not just celebrating the harvest season, and World Peace Day, but the purchase of the farm as a not-for-profit community asset - a fantastic achievement after 5 years of hard work. There will be fun and games for all the family, plus farm tours, live music (please bring instruments to join in), and a celebratory buffet. 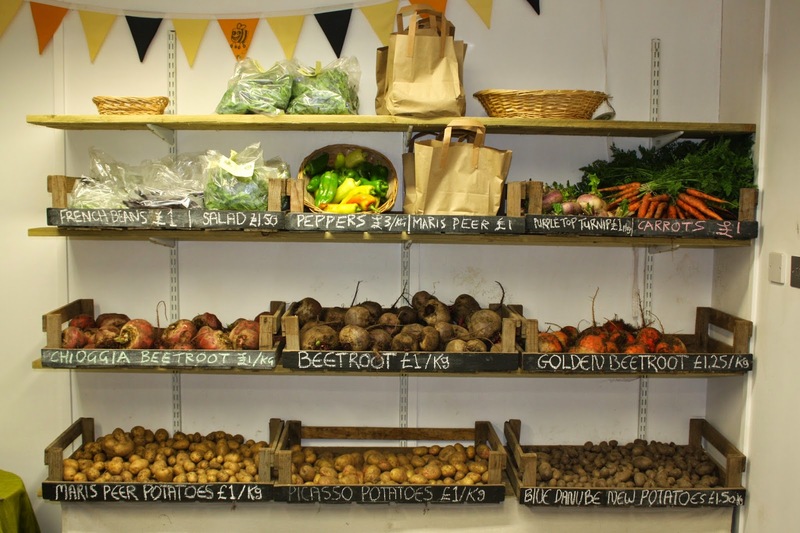 Anybody wishing to bring food (or drink) to share please call in to the farm this week to collect ingredients for free - we have plenty of veg! 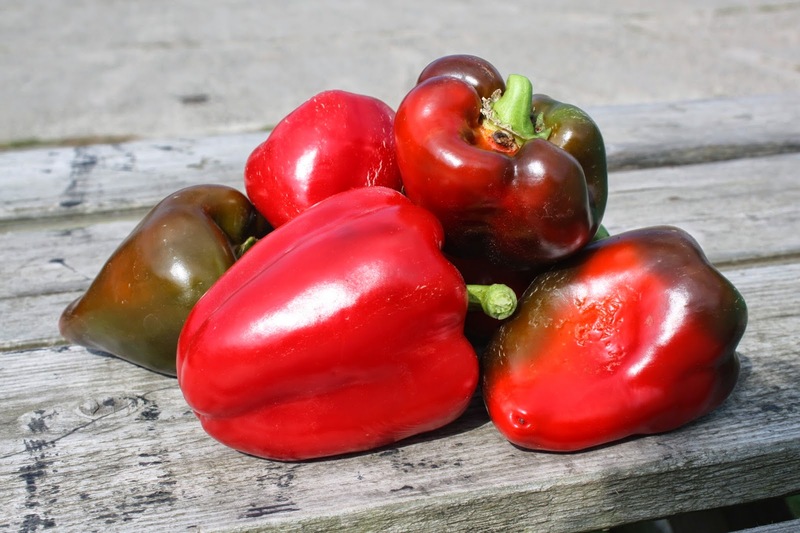 This year we trialled a few new varieties of sweet pepper, all of which we will be growing again next year, along with our trusted old friend the "long red marconi" (none of which have yet turned red this year). 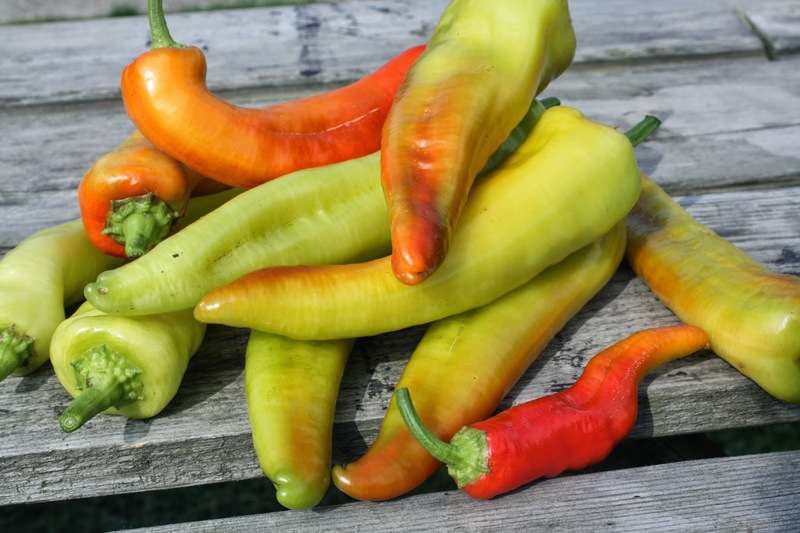 All the new peppers we trialled can be found on the real seed catalogue website at www.realseeds.co.uk. 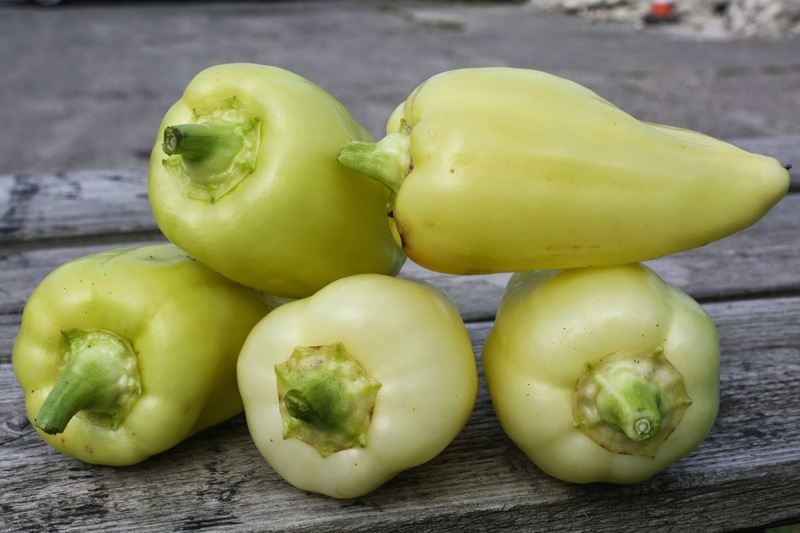 "Amy" Hungarian wax white pepper, the second variety to ripen this year. "Lipstick" red pepper, now turning red. 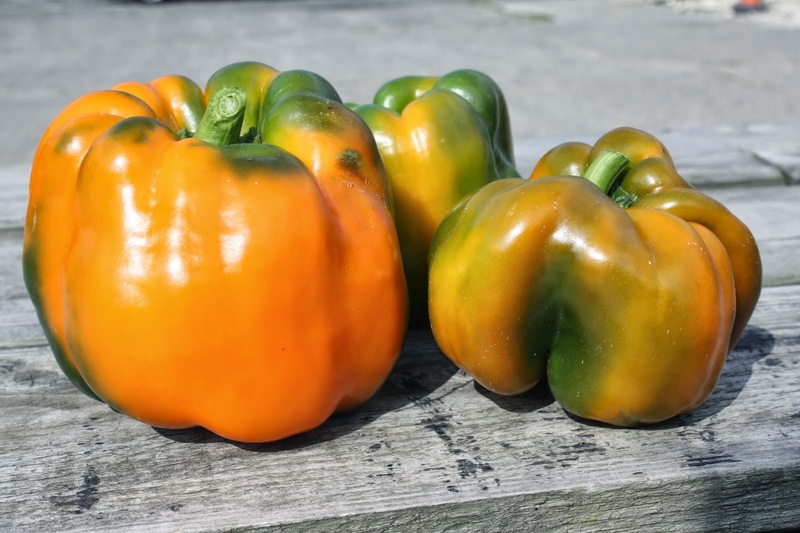 "Orange bell" peppers, now turning orange. "Semaroh" long thin peppers, the first to ripen this year. 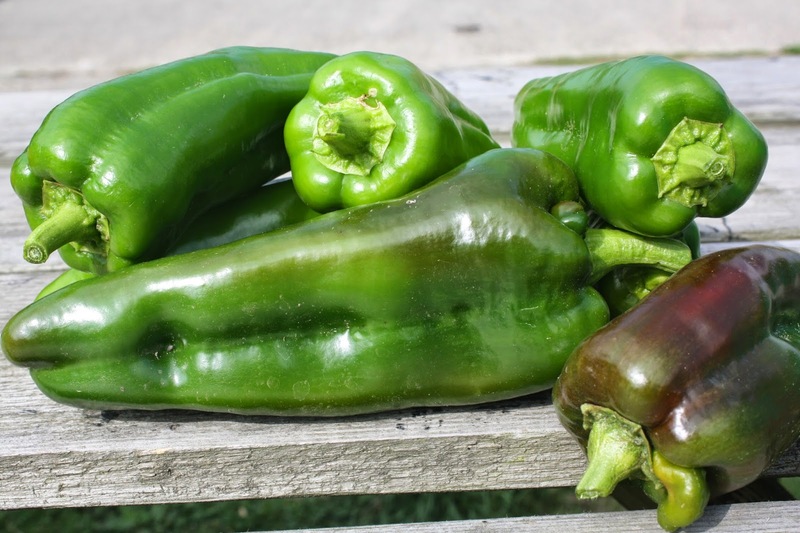 "Long red marconi" peppers, still green! 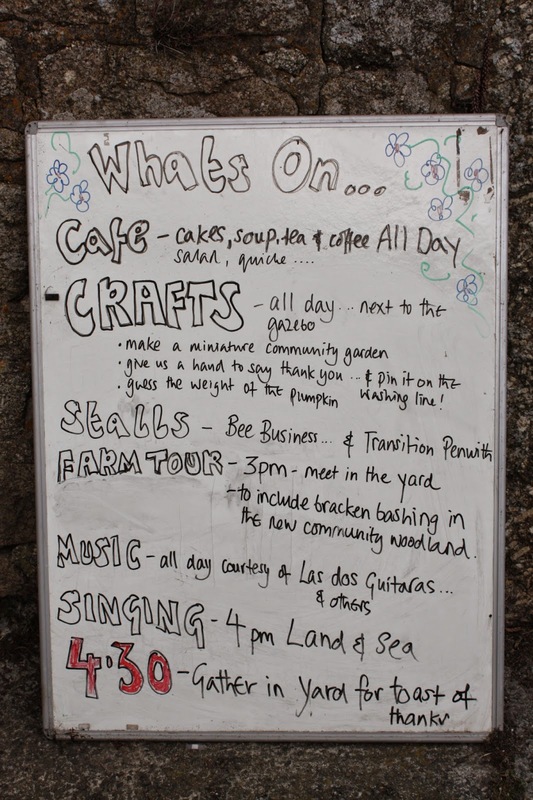 Sunday 7th September saw the National Trust's country fair at Botallack Count-House come round again, and as usual we had a stall there selling fresh produce. This year's theme was bees, so it was a good day to sell the honey collected from the Cornish black bees recently introduced to the farm. 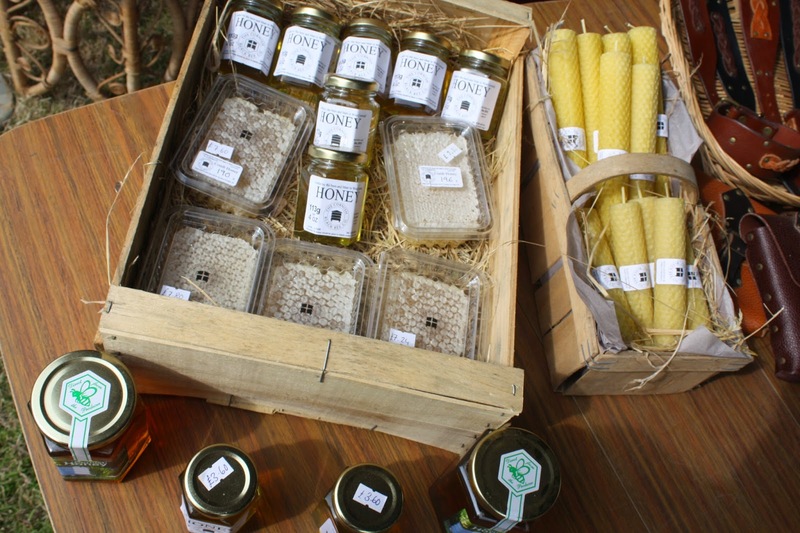 Honey and honey-comb from our bees. Our stall at the country fair. Red onions, white onions, carrots, radishes, globe artichokes, black winter radishes. This year we have enjoyed our best ever crop of beetroot, some of which weigh one kilo but are still deliciously tender. 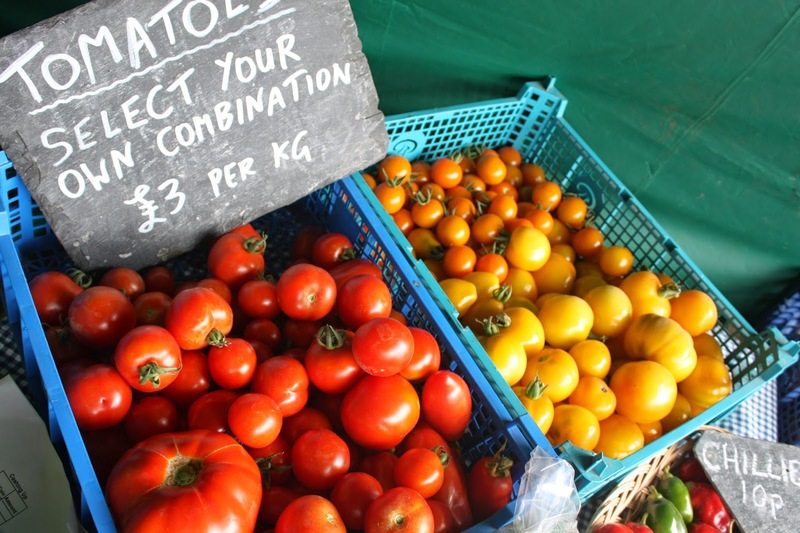 We have grown three varieties, a standard red beetroot called Bolivar globe, a yellow beetroot called Golden Detroit, and a pink-and-white striped beetroot called Chioggia. 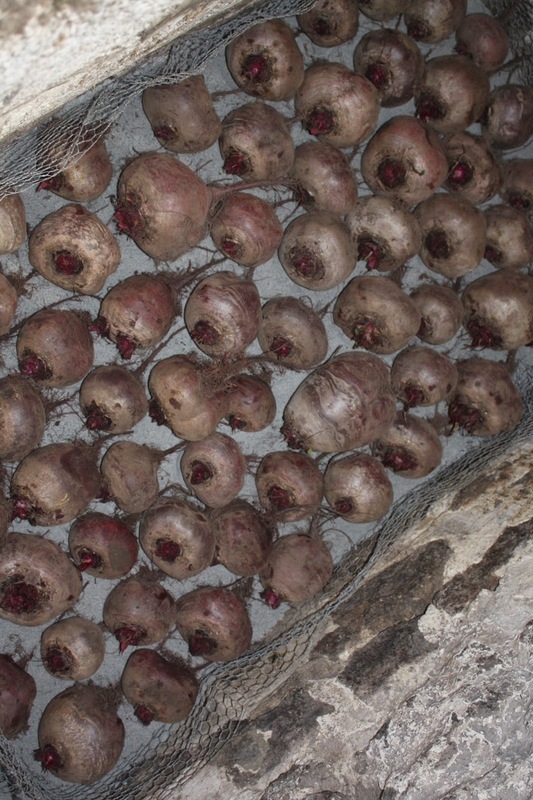 Today we picked half a tonne of the standard beetroot and stored them for winter in a sand-box in one of the outbuildings. This took 900kg of sand at a cost of £30. 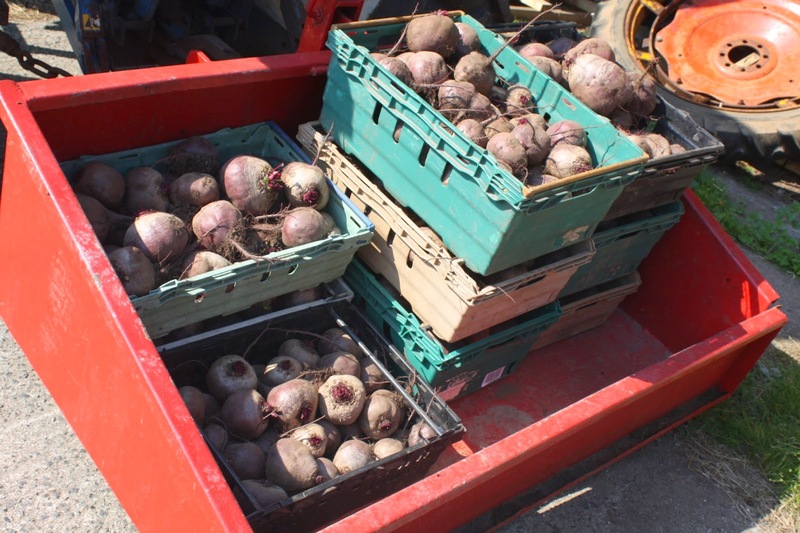 200kg of beetroot fresh from the field. The first layer of beetroot lain on a layer of sand. Sarah and Sophie adding sand between the layers of beetroot. 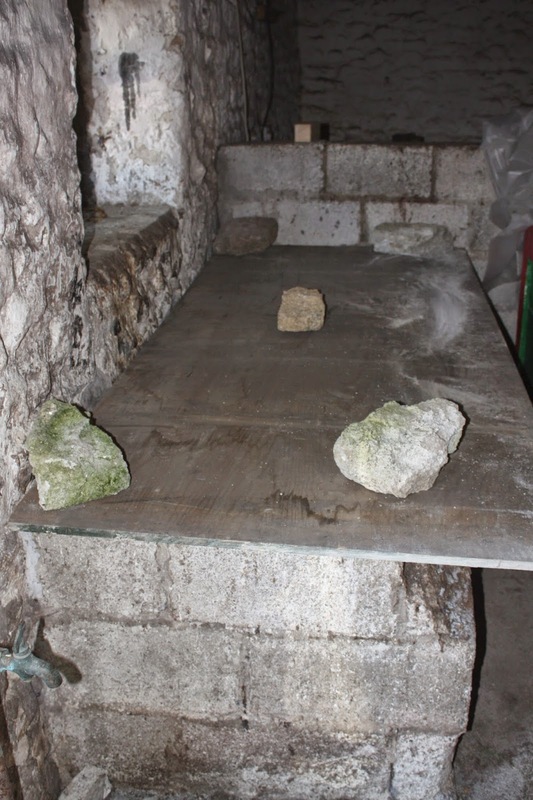 Both boxes filled and covered with a rodent-proof frost-proof lid. 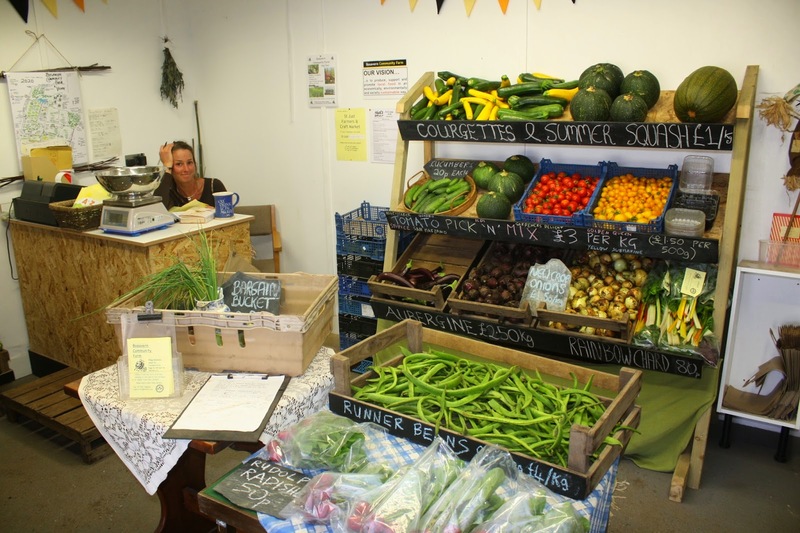 Our farm shop has been looking amazing this year, thanks to our volunteers and the good growing season, and here are some photos to prove it. 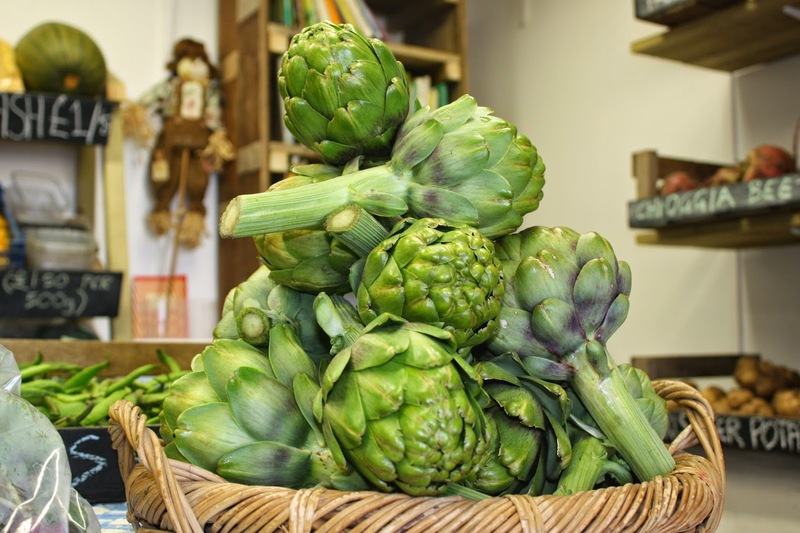 The first globe artichokes we've ever grown! (All fresh produce is from the farm). Thanks to Yann, from France, for volunteering for one week on the farm, and we hope you are enjoying your new farm in Ireland. 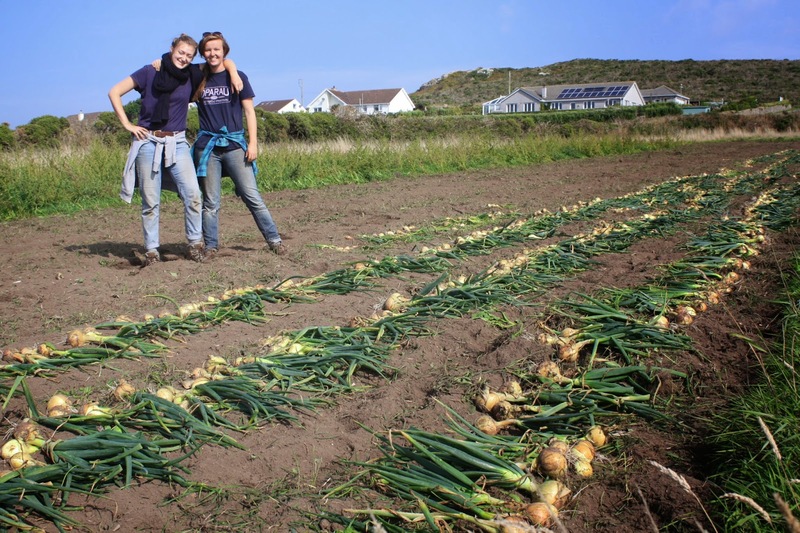 Unlike last year, September's weather is being kind, and we hope it will be possible to dry our onion harvest naturally in the field (last year we had to use a gas burner). 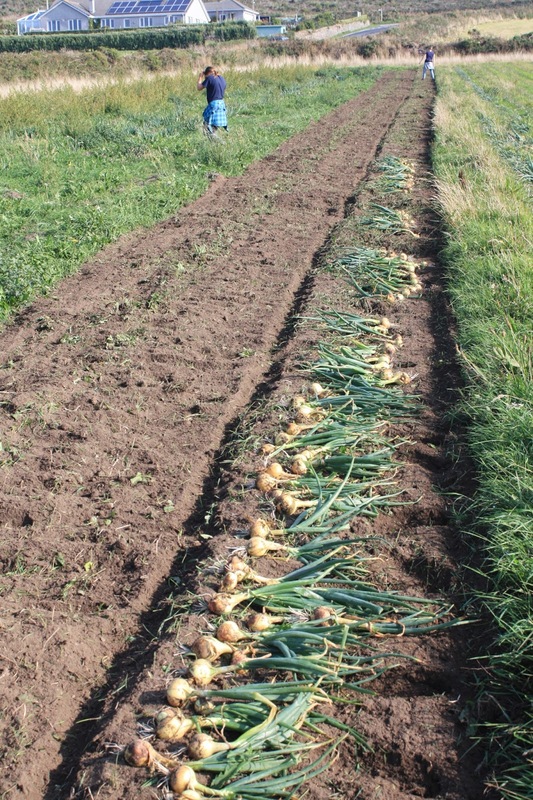 We have grown two thirds of an acre of onions, half of them red ("red baron") and half white/brown ("sturon"). 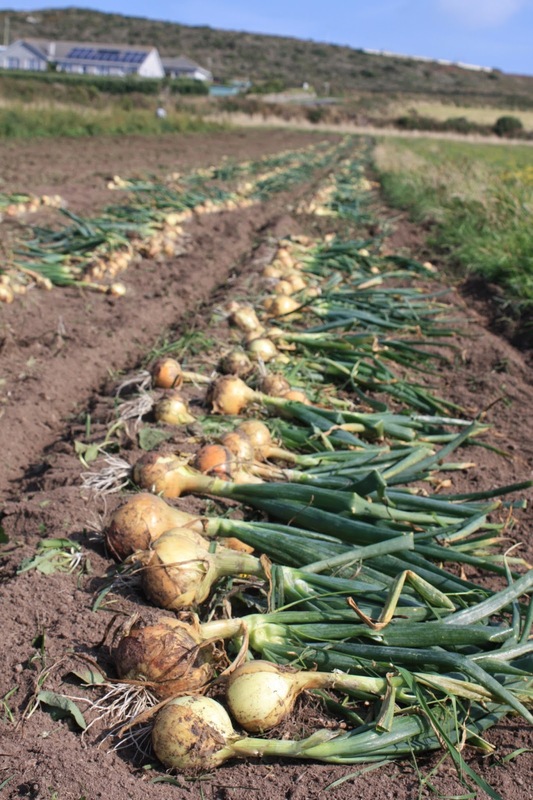 Although they did struggle with weeds the year has been a good one and we have the best onions we've ever grown. Yesterday we finished pulling them out of the ground, and they are now lying in rows on freshly-rotavated soil to dry in the sunshine and dry breezes (we hope). Laying the first line of sturon out to dry. Freshly picked sturon drying in the sun. Sarah and Sophie having pulled out all the sturon. Fingers crossed they dry and store well (no rain forecast for another week!). 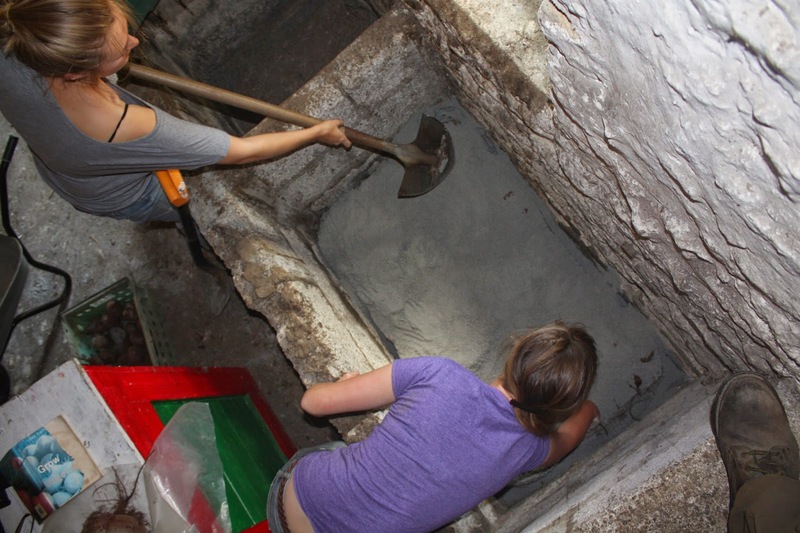 Many thanks also to Alice, Nikki and Pete for helping pull out all the red baron last Thursday. Ben, from France, left the farm yesterday after 2 weeks volunteering with us, to return to France and study for a masters degree in sustainable building. Thanks for all your help on the farm and in the house, and good luck with your studies. 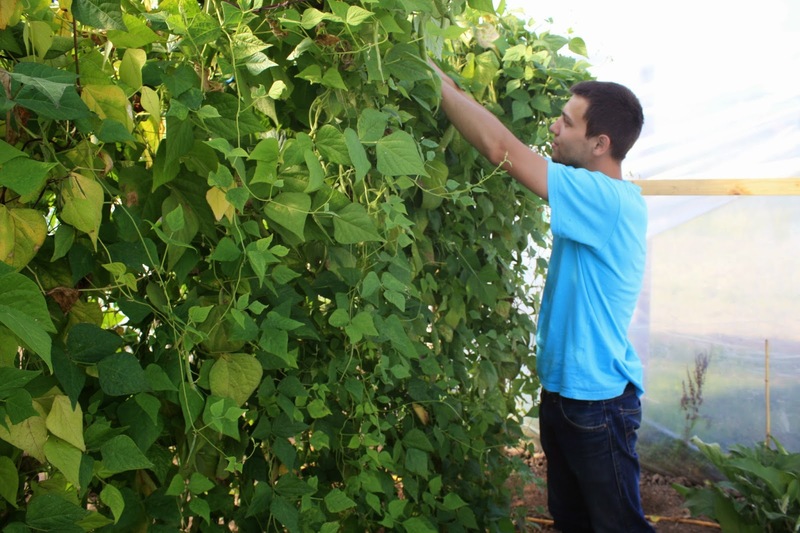 Ben picking French beans in the polytunnel. 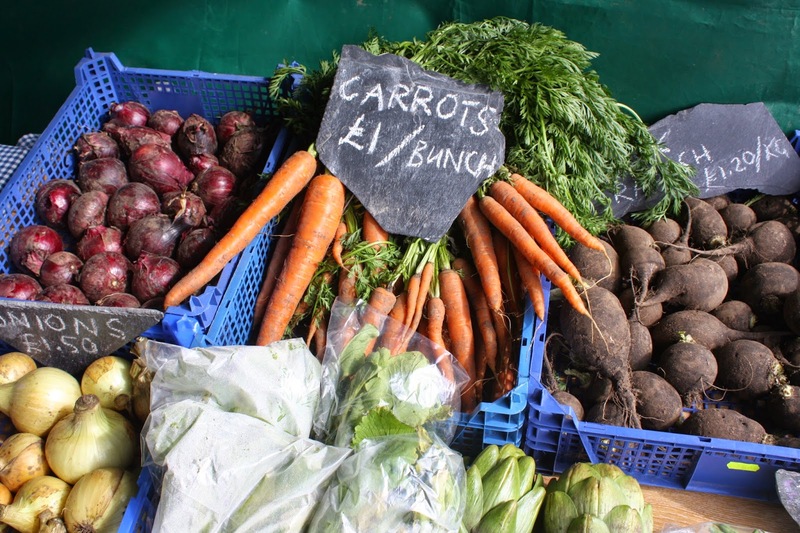 To join our veg box scheme please phone the farm on 788454.